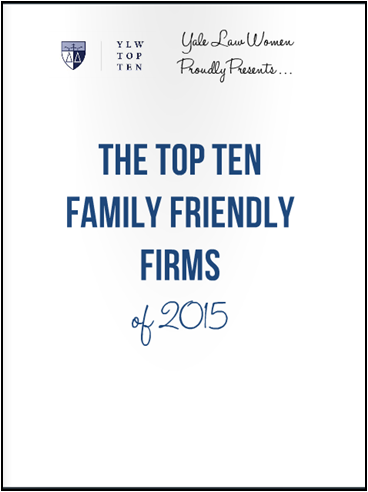 Yale Law Women measured and prodded and ranked large law firms, and issued a “Top Ten” list of family friendly firms. The main message isn’t startling: job seekers today look at employers’ work/life bona fides when making career decisions, and savvy employers are beefing up their work/life offerings in an effort to attract, retain, and advance top talent. Having a part-time or flexible work policy is not enough. The report by Yale Law Women shows what matters to them: employees have to actually use the policy, and they have to actually be promoted during or after they use the policy. Employees are aware of the stigma that often accompanies working a non-standard schedule, and they look for signs that demonstrate that flexible work is not a career-ender, such as usage rate and the number of past promotions. Other signs they look for: the percentage of men working flexibly (men are less likely to work flexibly if it will derail their progression, and it indicates a more egalitarian culture), and the percentage of partners (or executives) working flexibly (demonstrates that professional advancement is a reality, and shows acceptance at the top of the organization). Having a parental leave policy is not enough. As with flex time, the report indicates that employees have to use the policy, they have to use it for a sufficient length of time, they have to be promoted after using it, and men have to use it. These key data points reveal the cultural norms surrounding leave, and guarantee that the policy is not illusory. One comment in the report reflects a common practice: employers often grant men the right to take parental leave, but they let it be known that men had better not take more than a token amount of leave or it will impact their careers. The data will reveal this practice and steer applicants away. Employers who want to attract and retain talented men and women can provide accommodations for caregivers beyond part-time and flexible work and leave. The report mentions firms that have policies that allow attorneys to take several years off and return to their positions, on-ramp programs that hire experienced women lawyers who have taken breaks from their careers for child rearing, easy use of personal or sick days to care for sick family members, back-up care for children and adult family members, and onsite childcare. The report noted that almost half of the firms studied offered paid caregiver leave that could be used not only for birth and adoption, but also for elder care or a long-term illness in the family. 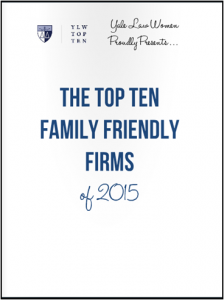 Additional takeaway: “family friendly” policies are not just for parents. Most employees will be caregivers at some point during their careers, and the best policies will allow employees flexibility and leave to care for aging parents or sick spouses or partners. Family-friendly policies are not enough to advance women into leadership. Two points to note: first, the report recommends that employers “manage the quality of experience better, so that an attorney can take leaves to care for newborns or aging parents without unnecessarily delaying achievement of the skills necessary for [advancement].” Managing better means working to reduce flexibility bias and caregiver bias so that being a caregiver does not mean giving up a career. Second, it recommends that employers look at their other policies that may be holding women back. We have some additional thoughts on what holds women back and what employers can do to advance women. Thanks to Yale Women Lawyers for this thoughtful study. Visit our website for more information about flexibility bias or caregiver bias, and a checklist that can help you prevent family responsibilities discrimination in your workplace. While you’re there, you can sign up for our updates.